It has been seventy-four years since Nazi concentration camps were liberated, and the Holocaust that claimed six million Jewish lives, along with five million others, came to an end. To ensure that our sisters and brothers did not die in vain and that the Holocaust never happens again, TINW Brotherhood will once again join Jews and others throughout North America to honor their memory, and to keep aware of the need for vigilance, by participating in the YOM HASHOAH YELLOW CANDLE PROGRAM. For other TINW Yom Hashoah programs click here. Enclosed you will find your Yom HaShoah Yellow Candle. We hope that you will symbolically join with other members of our synagogue by lighting one candle on Yom HaShoah, which begins Wednesday evening, May 1st, 2019. Yom HaShoah candles represent a highly visible symbol of both the yellow badge that Jews were forced to wear under Nazi occupation and the promise that we can make our world a better place to live. 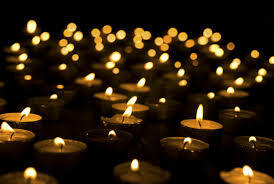 It is our hope that this event, centered on the lighting of a Yellow Candle, will become an annual event in your home. This is the nineteenth year of our participation in this program and the fourth year that we have named our participation in honor of Randy Zapakin who so passionately took on the responsibility of organizing this important endeavor over the years. The Yom HaShoah Yellow Candle Program began as a project of the Federation of Jewish Men’s Clubs. Brotherhood will be making every effort to either hand out or deliver a Yellow Yom HaShoah Candle package to as many of our families as possible. They will be distributed through the CJL, temple meetings and at services during the evening of Yom HaShoah. Additionally, packages will be available for pick up in the Temple lobby. As in the past, we are asking that you help us underwrite the cost of this project. Any funds collected over and above our costs will be donated to THE HOLOCAUST AND HUMAN RIGHTS EDUCATION CENTER.